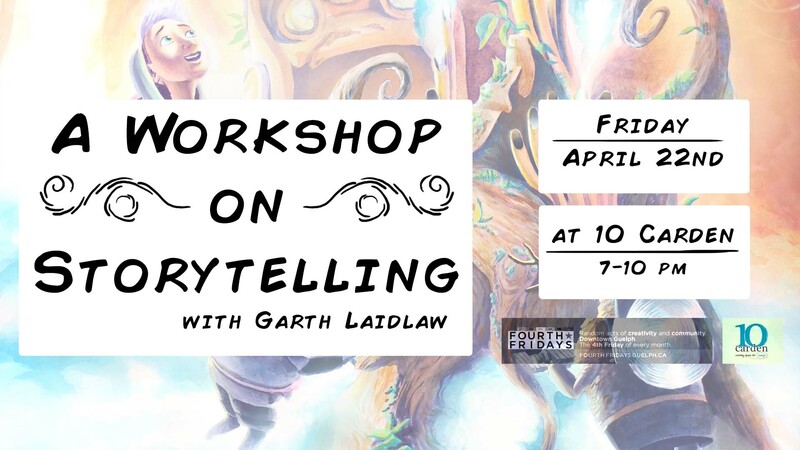 At his very first Fourth Friday’s event, you’ll learn to create many stories from this simple plot and character-building exercise. Create a setting and drama, sketch a potential character, and more. Where is this shindig? It will be held at 10 Carden’s Heritage Room which is located on the building’s third floor. The space is not accessible. I live in Guelph, Ontario where, among other things, I write and illustrate stories. I’m eternally curious, and try my best to infuse my stories and illustrations with fragments of my own life experiences. I hope in the future to tell stories through a variety of mediums like animated short films, or animated storybooks. I also hope to one day become an influential Canadian storyteller, who is able to make a living from telling stories that people love. I strive to create stories that are as sincere and honest as I can muster. I also want my stories to encourage discussion about our society and cultures as much as possible. In order to defeat the almighty creative block, I take long walks, listen to music, and always enjoy a good cup of tea. Aside from children’s books, I also create short animations and illustrate board games. In addition I teach art, animation, and storytelling and run weekly figure drawing sessions for the community. To see more of Garth’s work, visit his website . To RSVP to the event, visit our Facebook event page. This entry was posted in Art, Fourth Fridays, Literature, Workshop and tagged 10 Carden events, Art workshops Guelph, Guelph events, Guelph workshops by Fourth Friday. Bookmark the permalink.